Twins is located at the far end of Albert Road or the start of Highland Road, whichever way you want to look at it. This means that this Chinese restaurant is a five-minute walk from my house. I pass it almost every day and peer inside. It looks impressive but oddly enough, I have never seen it busy. In most cases, this would be a clear warning sign but one night, I went in anyway. On a Friday night, I was surprisingly the only customer in there. The huge empty space and countless absent chairs made this harder to ignore. Even still the staff greeted me warmly and sat me down with some complementary prawn crackers. They gave me a menu and left me to ogle the decor and decide what I would eat from the huge range of items on offer. It was pristine inside Twins and was sparkly and enticing with fairy lights and light projections that you could find from a school disco. 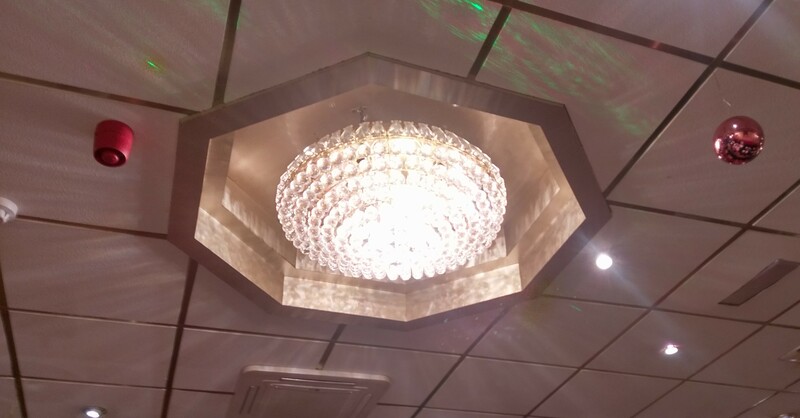 There was also a beautiful chandelier of sorts, that added to the light show, as well as glass tables and leather chairs. Each table was already prepared with plates and cutlery and wine glasses stuffed with folded, red napkins. They had clearly put a lot of care and attention into the presentation of the restaurant. I appreciated this greatly. Flicking through the menu, I realised I had bitten off more than I could chew. There were several pages with plenty of options for rice, noodles, duck, pork, chicken and fish. They were all very tempting and it took me some time to chose what I wanted. The waitress came over two or three times before I made my decision and each occasion, I batted her away. ‘I still haven’t decided,’ I shamefully admitted. She put her pad back in her pocket and paced the empty restaurant for the third time. She was very sweet and when I finally had decided, she flashed me another smile and took away the empty prawn cracker basket. My order was (drum roll please), duck pancakes, pork dumplings and tempura prawns with sweet chilli sauce. Runner-up choices included a whole boiled crab, jellyfish and their all you can eat hot pot. Twins not only had a wide range of options but an interesting range too. Some tempted me but others like the ox tongue or tripe were best left for the strong-stomached experimentalists. In terms of price, the items varied with some costing around £3 and some being £6 – typical costs for a Chinese which is both good and bad. Good because it wasn’t overpriced for what it was but bad because, if you’re like me and you like to sample lots of things, the total racks up quite quickly. This is why Chinese is not my first choice. The large menu tempts you with all these delicious treats and, the next thing you know, your meal is costing £20+. Maybe that is Twins’s problem but I think it’s more mine and my lack of self-control. I digress. My items came out shortly after along with a selection of sauces including hoisin and soy. 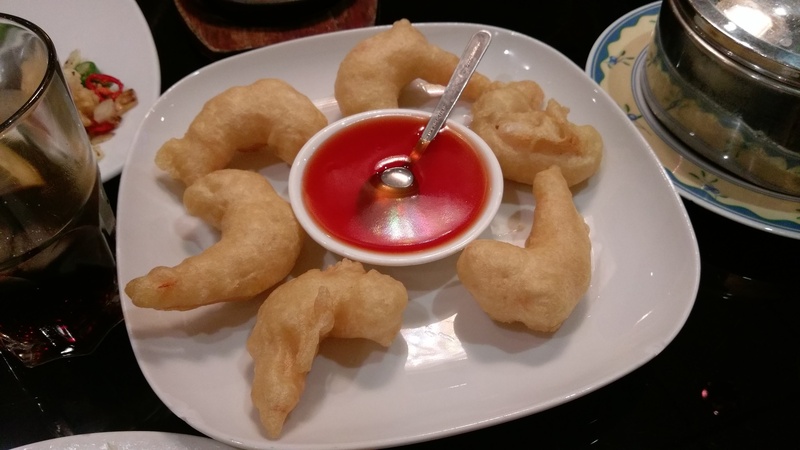 The prawns were placed in a ring with the pot of bright red-orange sauce in the middle. They were chunky and looked delicious. 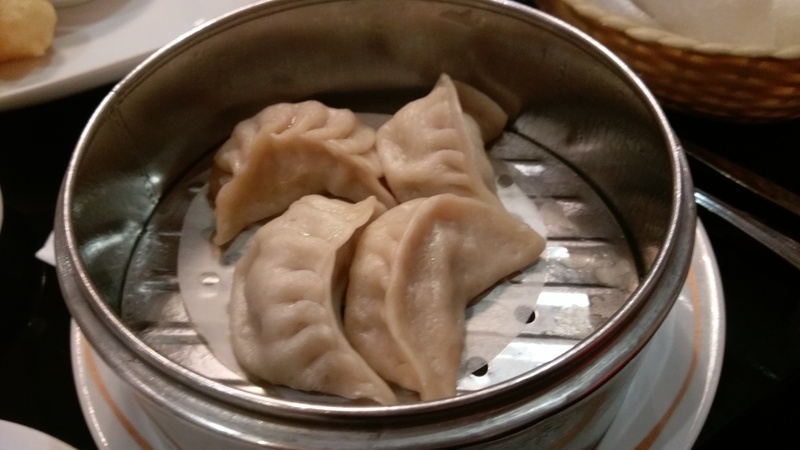 The dumplings were given to me in a metal steamer. For the duck pancakes, I was given another steamer full of the pancakes and a plate full of shredded spring onion and cucumber. A quarter of duck was brought out which a member of staff, in front of me, cut up. Swiftly and elegantly, he took a fork and spoon and broke up the tender meat into manageable strips. When he was done he smiled and walked away, leaving a huge pile of duck I knew I wouldn’t be able to finish. I started with the dumplings first as they are my absolute favourite and luckily Twins delivered. The outside was soft and chewy and the inner pork was fragrant and burst with flavour. The prawns were okay but did not live up to the same standard. The meat was thick and cooked perfectly yet the batter was slightly under-cooked meaning it was a bit soggy and greasy in parts. In the end, I found myself picking off the batter and dunking the naked prawn into the sweet chilli sauce. The duck pancakes were the best. They had given me plenty of fillings and the duck was tender and fell apart in my mouth. This would have been enough for me but, as I said, I have no self-control. Sadly, I ended up leaving most of it. My plates were cleared away soon enough and in their place, I was given some hand wipes and a thick slice of orange. The wipes were a welcome touch as my hands were covered in plum and chilli sauce but I wasn’t too sure about the orange. It was not your usual after dinner treat. Either way, I gobbled up my orange and waited to be served. But my waitress never came. I waited for about twenty minutes. I expected either a dessert menu, which I eventually assumed they didn’t have, or either the bill. In the end, I had to signal to the staff, wiggling my hand in the air and mouthing like a fish. I quickly paid up, pocketed the free sweets and on my way out grabbed a take away menu. Twins wasn’t the most incredible place to eat but that didn’t warrant the empty restaurant. The atmosphere was nice, the food was tasty and I had fun, even if the service was slow. I can imagine it being a great place for parties where you all chip in and help yourself – that’s if your friends are the sharing type. I may go back to Twins but I would sooner order a takeaway from there than sit down and eat again. Maybe that’s why it was so quiet inside, everyone preferred to eat out than eat in.